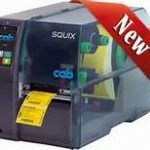 SQUIX printer available to order! The CAB A4+ Series printer has been discontinued. We will be selling off the inventory of A4+ printers and transitioning to the SQUIX. Cab is supporting the wear parts for the A4+ Series. When you purchase the SQUIX you can keep using your A4+ Accessories, you need to purchase the Adapter Screw PT# 5977586. Cab Technology, Inc. would like to introduce the next generation of thermal label printer. The SQUIX printers are built upon the foundation of the legendary A+ Series Printers. Cab Technology, Inc. has installed the fastest processors on the market and quadrupled the amount of memory to 256MB. Printheads have been redesigned so that exchanging is now more user-friendly with 200/300 and 300/600 dpi versions being interchangeable. Print speed was increased to 300mm/sec and integrated the ZPL emulation seen in the EOS Series. The peripheral interface allows SQUIX printers to be equipped with all the peripheral A+ devices such as cutters, applicators, and external rewinders. It has been suggested that if you are printing small widths it would be best to use the center justified or “M” printer. The printhead pressure is applied better to the small widths when centered. 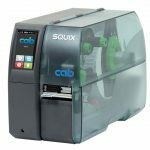 SQUIX printers feature a 4.3″ LCD resistive touch display which functions similar to a smartphone with direct access to menu items, instructional videos are available directly on the display to support the operator. WLAN is integrated as standard and compact flash card slot has been replaced with as SD card slot. The SQUIX will be offered in centered and left justified versions with multiple configurations such as Basic, Dispensing, RFID, and Textiles. The 4.3″ Prtinter will not be available until the week of May 1.